Many people use networks to share content such as word-processing documents or pictures, or even a printer connection. When you’re using a network to go online, you might not want to share your valuable data with others, so you may want to modify your sharing settings. Be sure you are part of the Homegroup and then press Win+I. 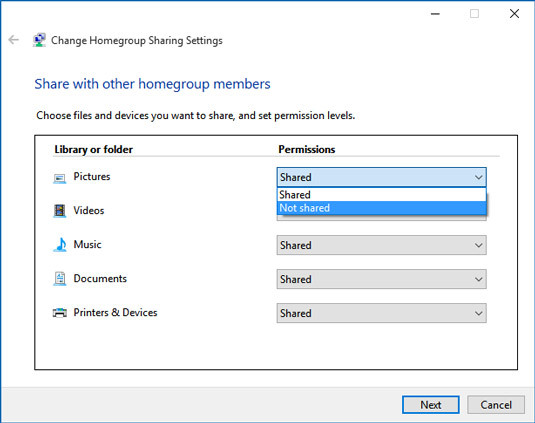 Click Homegroup, and then click Change What You’re Sharing with the Homegroup. Click the drop-down list for any item that is currently Shared and click Not Shared to change the setting. If you decide you don’t want to participate in the network anymore, you can leave it by scrolling down in the Homegroup window that appears in Step 3 above and clicking the Leave the Homegroup link. You can also share documents using a service such as Microsoft’s OneDrive. You can upload and share files using this service, and a small amount of online storage is free. You can then access this content from any computer whether it’s connected to your network or not.